The sheer scale of the Asus Zenbook U500 is quite a surprise when you first open it up - we're used to seeing thin and light laptops, yes, but not at this 15.6-inch screen size. We'd argue that its size means it isn't truly portable. It's more like a desktop replacement to have around the home; one that's light enough to use on your lap, or carry between different rooms. It's powerful too, and immensely sturdy, with an exquisite aluminium finish that follows on from the other Zenbooks Asus has released over the last few months. We really liked the Zenbook's keyboard; Asus has chosen to move away from the shiny and frankly diffi cult-to-use keys seen on the original Zenbook UX31. The inclusion of a numeric keypad will be useful for some, but we found it annoying - we're not used to those extra keys being there on a laptop. 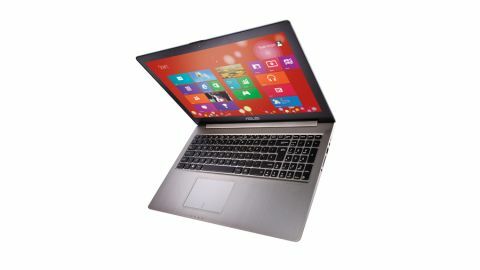 The core specs are superb, with a quad-core 2.1GHz Intel Core i7 processor, Nvidia GT 650M graphics and 8GB of memory. However, Asus has chosen to only include a 256GB of flash storage. That means the U500 is quick, but doesn't have the capacity for a vast archive of photos and videos. Asus quotes six hours of battery life for this laptop, but we'd say that if you're using it for a decent amount of work then you're looking at around four hours. That's not unreasonable, though it's not in the same league as many smaller, less powerful Ultrabooks. The high definition 1,920 x 1,080 IPS screen is, without doubt, high on the list of power-thirsty components. It's superb in terms of brightness and image quality though; we were truly impressed and text and graphics look very sharp. The screen, together with excellent Bang and Olufsen audio, makes this a great entertainment machine, although the chassis is too thin to accommodate an optical drive. The array of ports is reasonably generous, with a flip-down Ethernet port and three USB 3.0 ports and a card reader. The laptop is 19.7mm at its thickest, but as with other Zenbooks, the front is tapered - down to 6mm in this case. Display-wise, there's a full HDMI port on the side, but you also get mini-DisplayPort, too – there are included connectors in the box to hook this up to an older-style VGA port. Windows 8 edge gestures do work on the trackpad - for app switching and bringing up the Charms or app bar - but they aren't perfect and it takes some time before you're 100 per cent confident with them. The main problem with the controls is the lack of a touchscreen, but Asus says a touch-sensitive version is on the way. There were a couple of small issues: the laptop's fan can be noisy even when idle, and the screen's autobrightness seemed rather sporadic. In a darkened room, it fl oundered between dimmed and bright modes. Sadly, many laptops come pre-loaded with a lot of superfluous software. Top of the list here are a trial version of McAfee Internet Security and a suite of apps from Asus. Pop-ups from such software are annoying, and can take away from that box-fresh experience. This is a beautiful and powerful laptop, but the main problem with the U500 is its price tag. At around £1,417, you're talking about a considerable premium over many other Windows 8 laptops, and it just doesn't justify the cost unless you really do need a powerful yet large portable. If you're just going to use it at home, there's no point in spending this kind of money; get a powerful desktop PC instead.